Home is where the heart is and that’s from where people start the Diwali preparations. A month before Diwali everyone starts cleaning their homes and deciding on how to decorate it. People clean and decorate their homes in the best possible way, so that Goddess Lakshmi enters their premises and showers blessings on them. There is a number of ways to decorate home during the festival. Diyas – Diwali is the festival of lights and thus Diyas are the best way to light up the festival with. Diyas are the most traditional way of decorating homes during the Diwali festival. Diyas come in a huge variety of clay , metal , silver , wood, and many more. Now a days lot of colorful and creative diyas are available with online sites also. Many variety of diyas come with ganesh and lakshmi idol attached to them . Candles – For the modern homes , we have designer candles like Buddha candles, tea light holders in various forms, motif candles, set of small flower candles and lot more. Scented and floating candles are very popular for gifting and decorating during Diwali . Diwali Lights – People spend a lot of time in deciding which lights to buy and where to put them up at their homes.Diwali lights no longer come just in the form of colorful bulbs. Now you will find a huge variety of color and creativity in the form of diwali lights. Best part this , today people not only buy lights for the balcony décor but also to hand them in the drawing rooms. Traditional lanterns also play a good part in decorating the hall. Lights also come in shape of diyas, Om , Ganpati illustration and lot more. Rangolis- Diwali is one occasion when everyone decorates the entrance of their home with rangoli. People either create rangolis traditionally with color and beautiful designs or they buy decorative rangoli mats from the market. Torans and wall hanging – Floral and decorative torans are placed at the entrance of the main door. Leafy , floral, Kalash and many other designer torans are available on online websites . Ganesha wall hangings, key holder, shubh labh kits have no boundaries for creativity. 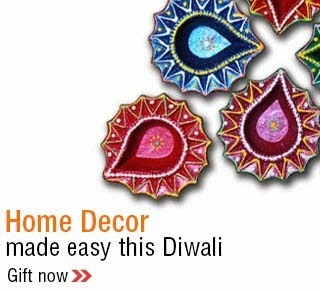 You will find the best of designs on websites selling Diwali products. Lastly, the colors for Diwali are yellow , orange, red and green so go ahead and decorate your bedrooms , and living rooms with the bright colors. Purchase a few festive colored bed sheets, curtains and decorative traditional pillows for the occasion and give your home a festive and welcoming look.